It’s always an exciting time. The announcement of the theme for a new Iron Viz Feeder Contest almost feels like the start signal of a race. Though by now It’s a race I’m sure many of us are getting used to. 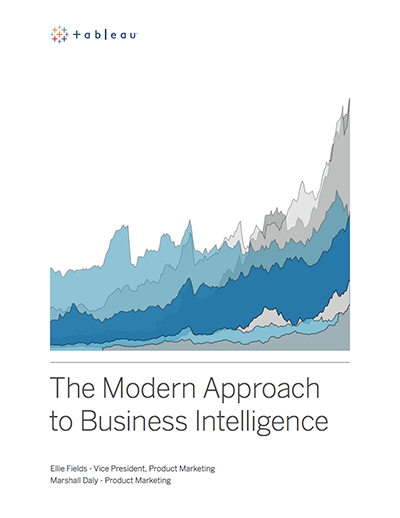 Each year, dozens of contestants enter in the hope of winning a spot in the final contest at the Tableau Conference. Seasoned participants and new entrants compete side by side for the “golden ticket” to TC. Brilliant material and amazing creations surface during the contests. With a few dozen entries every edition, we never fail to see experienced participants show off unmatched skill and competence. Alongside them, Iron Viz “rookies” display unseen creativity and determination to succeed. Being a competitive spirit myself, I find myself perusing the entries just after the deadline to gauge my chances. And each time, I find entries which have me say: “… Dayum! I wish I’d thought of that. My odds against a masterstroke like this are close to zero!” Now of course, this competition is all in good fun. It’s both exciting and fulfilling to see that the Tableau communities can count such skilled individuals among its ranks. 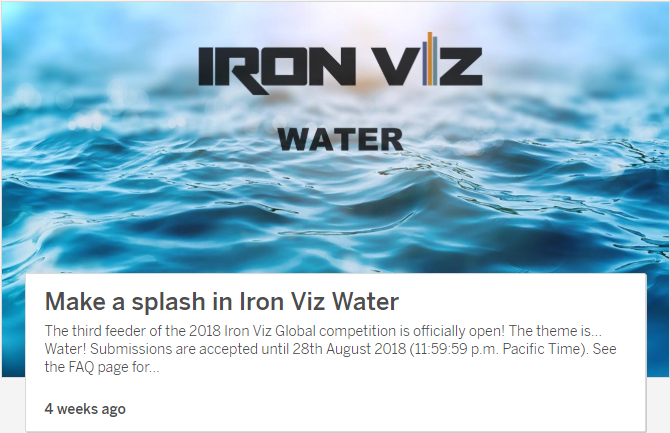 The theme for the third 2018 Iron Viz feeder, water. Having failed to participate in the previous feeder editions due to a lack of time, I was eagerly awaiting the announcement of the final installment of this year’s feeder. As soon as it was revealed to be Water on August 1st… boom! The race had begun! Wildly start looking for all datasets that are even remotely related online. At the same time, ask for advice from family, friends and colleagues. Suddenly have too many datasets and ideas, so start working on all of them at the same time. Notice that some of these are working better than others. Try to focus on one, but fail to do so. Decide to proceed with a few datasets and “we’ll see later which one is best”. Three weeks later, end up with an entry that consists of those few datasets instead of one anyway. This isn’t the first time this happened to me. 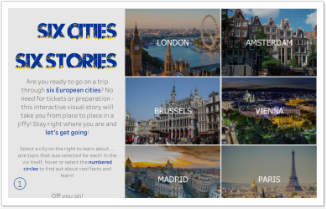 With this year’s European City theme, I “focused” on six cities instead of one. Before that, I couldn’t settle on one animal or species either, but I had to compare them “all”. I’m not sure whether it’s good or bad, but what I do know is that every time, participating in the Iron Viz feeder contest has pushed the limits of what I thought I was capable of. 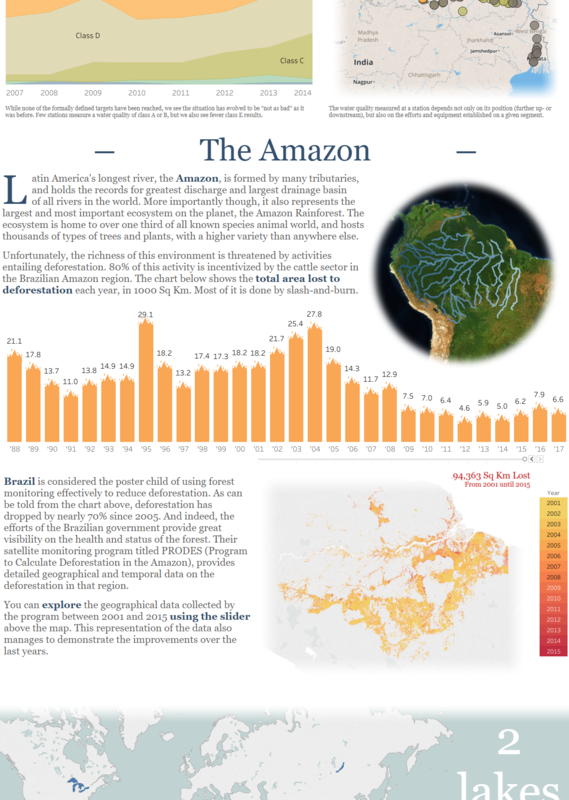 With this edition on Water, I’ve combined more datasets than ever (there are 12), and I’ve utilized techniques I’d never used before. In addition to that, I believe I’ve concentrated more on storytelling and analysis than before, where I had often spent a lot of time creating what I think are more complex and technical Tableau feats. Whether this will have any significance in the outcome, we will find out. Regardless, this has been without a doubt a great and enriching experience again, which I’m sure will prove useful in the development of my skills as a visualization and analytics professional. Anyway, I’d be delighted if you have time to have a minute to look at my entry, and even more so if you find time to provide some feedback! You’ll find it through the image just below. Cheers! This is “World of Water”. Or at least, part of it.